When Arthur Brown signed his last will and testament in 1906, he was unknowingly signing his death warrant. Usually when people are killed over the contents of their wills it is because the murderer is impatiently greedy. In the case of Brown, a 63-year-old former U.S. 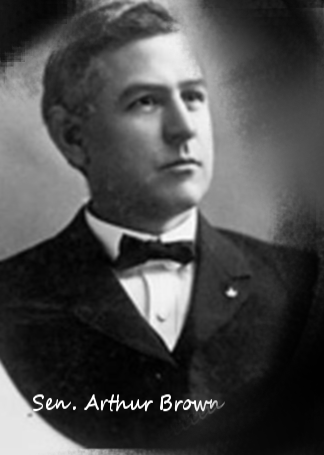 Senator from Utah with exceedingly loose morals and a wandering eye for women, it was the exact opposite: when Brown specifically disinherited Anna Bradley, his mistress and the mother of two of his children — and subsequently refused to marry her — she felt the necessity to shoot him down in the Washington D.C. hotel where he made his home. The senator’s will, signed a few months before his murder, made it quite clear how he felt about the mistress he had “ruined” and provoked to shoot him in the gut with a .32 pistol. I have never married said Anna M. Bradley, and never intend to. If she should pretend that any relation ever existed between us to justify any such inference, I direct my executors to contest any claim of any kind (so) that she receive nothing from my estate. After Anna admitted she shot Brown in cold blood, public sentiment was strongly against her. The early press reports described 34-year-old Anna as a divorced madwoman with two legitimate and two illegitimate children who was stalking Brown and that he was some kind of martyr. Once her defense lawyers made his will public, the general sympathy quickly shifted in her favor. They promised to justify the murder by showing Brown was a cad who had strung along his mistress until she was insane. His murder revealed that Brown had an unsavory reputation and had earlier escaped being shot by his first wife in Kalamazoo, Michigan, where he worked as a successful lawyer. His wife, made desperate by Brown’s notorious conduct with Isabel Cameron, who kept a stationery stand in the city hall, entered his office with a revolver and threatened his life. He dared her to obtain a divorce, which she did. While his wife obtained a divorce on the grounds of adultery, Brown and the Isabel fled to Salt Lake City where they married. Despite not being a Mormon and a divorced man with a disreputable history, Brown and his new wife were welcomed into high society and Republican politics there. Many of the Gentiles in the territory considered him a “jack Mormon.” The term jack Mormon has several connotations. In this sense we mean a non-Mormon who lives among the Saints and supports the church’s beliefs and practices. The term is a pejorative assigned by foes of the Mormons to Gentiles who kowtow to the Church. Brown was selected by the Utah legislature in 1896 to be one of the new state’s first U.S. senators — along with apostate Mormon Frank J. Cannon, whose fascinating critical history of Utah politics under the Church of Jesus Christ of Latter Day Saints can be found here and in text form at Project Gutenberg. In Washington, the first issue of Brown’s second marriage, a child named Max, was born. Through no fault of her own, Isabel Brown was one of several proximate causes of her future ex-husband’s death. It’s impossible for a zebra to change its stripes, and Brown was no exception. He began an affair with Anna while in the capital city. The Senator told me he was very unhappy, very wretched. I had told him that our relationship could only result in grief and sorrow, and he replied that he would stay by me all my life. Finally he came to me and said: “Darling, we are going on together all through life; you can’t avoid me.” Finally, after several months, I consented. Like her predecessor — but without the gun — Isabel confronted her husband when she learned of the affair and he coolly told her to obtain a divorce as his first wife did. Instead Isabel obtained a warrant and Brown and Anna were arrested, adultery being a crime at the time. The case went to trial but Brown was acquitted, Mormons being very hesitant to convict on these charges. Crimes of infidelity were particularly serious in Utah at the time due to the fight over polygamy. Church leaders with plural wives were being arrested and charged with bigamy or adultery and were being given significant jail terms when convicted. More frequently, however, the polygamous church leaders simply chose to disappear. The marriage was doomed, however, and in 1903 Brown once again showed his mettle by failing to pay Isabel the $150 per month (nearly $4k in 2014 dollars) alimony she was granted, for which he was convicted of contempt of court. He was taken to jail until he made full restitution. Within a year Isabel was dead and Brown, no longer a senator (his term had expired and he was not re-appointed) thanks to how he had embarrassed the Beehive State, was free to pursue his pleasures. Rather than return to Utah, known for its puritanical morals, he remained on the East Coast representing the interests of various Utah industries with Congress. Anna’s husband Ned, shamed by his wife’s notoriety, took solace in the bottle and was eventually convicted of stealing from his employer. He went to prison and divorced his wife. Once he was released from the pen he remarried. After Isabel’s death Anna returned to Brown and demanded that he marry her and legitimize her two children (the legitimate ones she left with her ex-husband’s family). A third pregnancy ended in an abortion, which the press hinted at by using the term “a criminal operation.” There was public speculation that Brown himself performed the procedure. According to letters introduced at her trial, Brown apparently agreed to her request to acknowledge his offspring and planned to legally recognize the two young boys as his children, which had done informally. “This is my beloved son in whom I am well pleased,” he wrote in one letter, quoting the Gospel of Matthew from the New Testament (and the words the Mormon prophet Joseph Smith said God told him while Smith was translating the golden plates). He pledged to make their older son, then about 10, chief justice of the Supreme Court. But Brown also had another pen-pal: a well-known actress, Mrs. Annie Adams. Once Anna Bradley found out that not only were Brown’s words hollow, he had another love interest on the side, the ex-senator’s days were numbered. n.b. Annie Adams’s daughter, Maude, was the first woman to play Peter Pan on the stage. Her classic beauty deserves a link here. 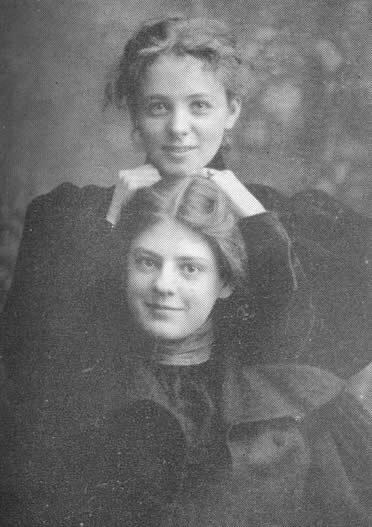 The woman on the bottom is Ethel Barrymore. My dearie, My dearie: The world seems to have taken on another hue because, perchance, I have heard from you, which means so much…I spent my Thanksgiving Day giving thanks for you and my very happy state of feeling, which one year ago I never dreamed could be possible. It seems too sweet to even be real…Love, dear heart. Brown had less than two weeks to live. More than a century before a time when philanderers could be tracked by their tweets, texts, or cell phone records, Anna was told by a detective she had hired to spy on Brown about his “infidelity” with Annie Adams. In December 1906, Brown was in Washington to argue a case before the U.S. Supreme Court and had taken rooms at the Raleigh Hotel. When Anna was told by her detective, she immediately set out for D.C. and checked into the Raleigh using the name “Mrs. A. B. Brown,” although she did not identify herself as Brown’s wife. The clerk, assuming it was just a coincidence, assigned her a room on the same floor as her former lover. Almost immediately upon her arrival she went to Brown’s suite and confronted him, demanding that he marry her. A maid heard two shots and summoned the hotel manager, who sent for the police and administered a dose of brandy to the injured man. Then he ordered Anna to leave the room, but she refused. Brown was rushed to the hospital and immediately taken to surgery. Physicians found that one bullet had grazed his left hand and the other had lodged in his “pelvic cavity.” Surgeons worked on the ex-senator for more than two hours before deciding that it was best to leave the bullet in situ. At that time the doctors described his condition as critical, but said there was hope for his recovery. Brown lingered on for two days before he died of a kidney ailment that was aggravated by the gunshot. It took nearly a year for Anna’s case to reach a courtroom, thanks to her initial plea of insanity. Once the alienists declared her sane, in November 1907, she went to trial. “Do you remember the time you struck him in the mouth with an umbrella and knocked his teeth out?” asked the prosecutor at one point. In a thread of a voice, at times inaudible even to the court stenographer, she told a story which has never been equaled in a Washington courtroom…As she told with piteous shrinking the story of her downfall, her voice broke, she bowed her head in her hands, and the bitter tears ran through her thin fingers. Few of the eyes which watched her were dry. The jurymen, leaning forward in their chairs to hear her, wept too. Despite her admission that she shot him in cold blood, Anna’s defense presented a strong case with witness after witness claiming to have heard Brown admit paternity and make promises to marry Anna. The defense was unable to produce any such written statement. In 1903, however, Brown told Anna that he was reconciling with Isabel. When Anna blamed him for sinking her to “the last depths of despair and degradation,” he reversed himself, telling her that he was only trying to avoid going to jail for adultery. According to Anna, he renewed his promise to marry her and acknowledge the children. After a month-long trial it took the jury two days to convince the one holdout who was willing to convict her on manslaughter charges that she should be acquitted. When the jury returned and announced its verdict, the courtroom erupted into cheers of approval and applause. Brown’s illegitimate children attempted in 1910 to break the terms of his will without success. Five years later, Arthur Brown Bradley stabbed his older half-brother to death. According the State of Utah historical society, their dispute was over who would wash the dishes. Anna Bradley returned to Utah where she died in 1950.